This coil roofing nailer drives fasteners with increased range, from 3/4- to 1-3/4-inch galvanized roofing nails. It is lightweight and well balanced at only 5.96 pounds. Features include a shingle placement guide, long-life carbide-steel contact parts, a new comfort-grip handle, and fast, easy, one-piece, one-step loading. 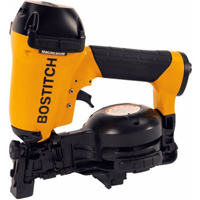 This nailer is excellent for asphalt shingling, insulation board, vinyl siding, fiber cement roofing, and siding.